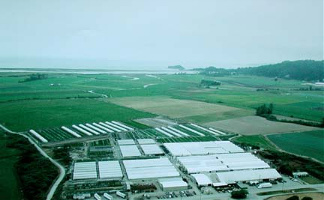 D&W Nursery area with bulb fields to the right with the Smith River and the Pacific Ocean in the background. producing holiday and spring flowering plants. We also grow several acres of outdoor blooming plants. Dormant hydrangea crops are grown for other growers in the U.S. and offshore. More than 1/4 of the Easter Lily BULBS grown for use in the U.S. & Canada are grown here at Dahlstrom and Watt Bulb Farm located in Smith River California.